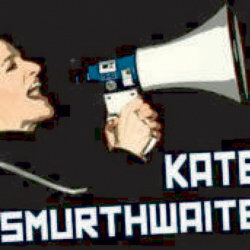 Kate Smurthwaite is an atheist leftie feminist comedian, but that is no reason why she should not be taken seriously. In spite of a venue with a Mussolini quote on the wall, hardly conducive to her show, she regularly attracts a mixed gender crowd, and one of all ages too. And so she should. She is opinionated but in a good way, and is an engaging personality and an eloquent speaker, it is little wonder that she is much in demand in the media for opinions and discussions. Don’t expect an all out assault on men, far from it she is just a passionate performer who has no problem in dealing with those she sees as villains be they Daily Mail writers, politicians both British and American, radio presenters or even her mother-in-law, but none of these make the nomination of villain of the show. It is however totally ‘safe’ to sit in the front row of her shows, even if you work in the financial sector, or even a PR in the defence industry. Any argument she may have is with others not in the room.